If you’re used to working out alone, you may be missing out on some key advantages that having a training partner brings. 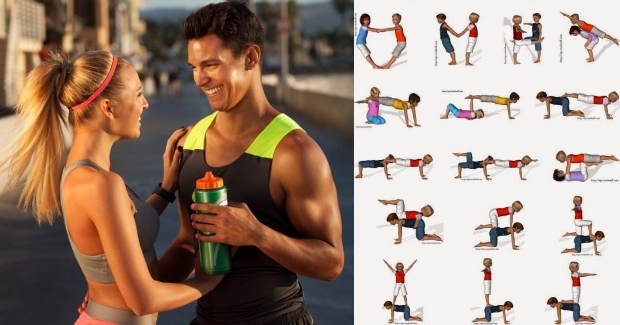 So, before you nay-say the idea of finding a pal to exercise with on a regular basis, consider these eleven exercises you will have if you work out with someone else! This workout might actually make you enjoy doing exercise. Most things are more fun if you do them with someone else. Especially workouts. Why not team up with your other half and do a joint workout in your very own home or even the gym? A gym partner will help you broaden the scope of what you can do in the gym. You will be able to perform numerous partner exercises that you can’t do solo. The chipper-hurricane, for example, is an exercise in which you perform different workout routines as fast as possible, and whenever your partner slows down, you tag them out and take over. Light jump for eight counts, followed by a wide deep squat and back up. Engage your abs while squatting, keep your chest lifted and proud, and make sure your knees don’t go past your toes. Make the jumps more difficult by switching to high knee jogs. We can often shy away from push-ups but they’re great for strengthening posture and revving up metabolic rate, so this is a fab way to add some fun to the sometimes mundane exercise. Change up the tempo for more control and a deeper workout, make sure your abs are always engaged, and keep your chin lifted out from your chest. Hold each other accountable by doing a different workout each, then swapping. A wall sit is an easy set-up, but will challenge the mind and body by blasting calories, streamlining legs, and building endurance. Make sure your hips are low, in line with knees, and that your knees reach over the ankles but not past the toes. Add your partner to the mix doing tricep dips pressing down on the legs, which will be challenging but effective for all. Cross jump lunges bring a great cardio element to your workout. Since you’re facing each other, challenge one another to go deeper into the lunge and push further past the 20 you initially set out to do. Keep an upbeat tempo when doing this exercise so you don’t lag behind. Spring from your feet and always be mindful of your abs to help you power through. When you’re the person doing wide second, you’re also the ‘spot’ for this exercise; if you notice your partner is struggling in the long form push-up position, help gently place their feet down on the floor for safety. Make sure you bend together, and encourage your partner to stay strong and focused as this is a challenging workout. When you’re doing the leg toss, make sure you feel your rib cage imprinting down. Stay relaxed in the shoulders, and either press your hands down into floor or if you experience lower back discomfort, or place them under your hips to help with form. This is a great partner exercise – but there’s lots of trust involved. Lock hands and pull back from each other to sit down into and imaginary chair. Keep your knees directly over ankles as you each bend to touch the floor, and you’ll feel the burn in your legs as well as a sizzle in the waistline. You know the set up for these, so make sure you focus on encouraging each other to push, push, push! If mountain climbers aren’t your jam, hold a plank instead. Hold hands and each stand on one leg while the outside leg lifts and lowers. Make sure your supporting leg is slightly bent so you feel the burn, and hold a tight squeeze into the bum as you move at a moderate pace. Lie back onto your forearms and round your lower spine. Be sure to hold your bellybutton down as you move your legs in a half heart movement. You will notice when you drop your legs a little lower it gets crazy intense for your core. Switch sides to even out the workout.